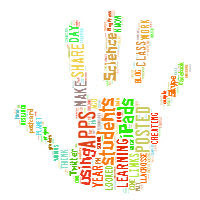 Conversations: Learning and Growing: Are We Going To Use The iPads? Are We Going To Use The iPads? Our final day of summer learning camp, and one of the fourth graders blurted out, "Are we going to use the iPads today?" I paused before I answered. I knew the answer would be YES, but I wanted to really think more about the question before I answered. We had created amazing books about ourselves through ScribblePress. Many students were receiving their printed books today. (They were high quality books and very quickly shipped!) Others had viewed their books at home with family. We had written paragraphs about our favorite sports and games with Popplet and Pages. The color copies were proudly displayed in the hallway and ready to go home today. Many students chose to read their paragraphs aloud to the class. And, we just had a blast with all the math apps! From working on number lines in Pearl Diver to basic facts in the game based MathDrills app, we loved it. So, could I really get annoyed for the blurted out question, "Are we going to use the iPads today?" No. We did have a lot of fun. We built up confidences as readers and writers. And, we enjoyed what normally could be a VERY boring way to end summer. My incoming 5th graders will have this same mode of thought for the first few weeks of school. They will walk in each day with the same look in their eyes. They will be anticipating class for that most important reason. Will we use the iPads today? Are we connecting with anyone on Skype? Do you want me to send out the tweets today? Do we have a science lab to explore today? Did we get a response back from our friends in Georgia? Can I show you this app we could use? Can I post my Toontastic to Edmodo? And, that is when it is exciting! The iPad is just an iPad. It is just a tool for learning, exploring science, showcasing our questions and learning, a way to connect, a way to create...Ok. An iPad is just an iPad. There is a point when the focus is technology. I think it happens with all new tech. The amazing part is when the technology isn't the focus any more! Popplet + Pages= Fun Writing!